Defensive End Kingsley Enagbare from Hapeville Charter School. The Hornets are 5-1 and ranked #2 in AA. Their only loss was a 1-point loss to the highest ranked team in all of Alabama. Otherwise they have (convincingly) beaten three top-10 teams in Fitzgerald, Pace Academy and Wesleyan. 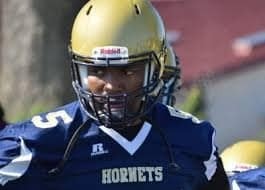 Kingsley is having a fantastic season as a 3-tehcnique D Ened on the hornets Defense. He is a 3star prospect on 247sports with offers from every major program in the southeast. He is committed to South Carolina. A strong student, Kingsley will be an early graduate this December.